The story of industry in late 18th century Manchester is well told. Less so, the growing town’s predilections with cultish religion. Protestant England at that time was rife with sects. The well-known, which have lasted: Methodists, Quakers and Unitarians. The obscure: Sandemanians, Thraskites, and Shaking Quakers. This arose from the post-1688 Glorious Revolution freedom to worship in whatever way one chose – as long as it was not Roman Catholicism. The most powerful religious presence in Manchester in the late 18th century was Emanuel Swedenborg (1688-1772), a Swedish visionary, scientist, philosopher and Christian theologian whose work also had a profound impact on William Blake. Swedenborg was born Emanuel Svedberg in Stockholm in 1688 and was appointed Extraordinary Assessor in the Royal College of Mines by the King of Sweden in 1716. During his spell as a royal adviser, Svedberg planned and designed a submarine, airplane, steam engine, air gun and slow-combustion stove. He was the first individual to explain the importance of the pituitary gland and the cerebral cortex, the first to identify electrical phenomena (two decades before Benjamin Franklin) and pioneered the notion that atoms can be broken up into smaller particles – a theory which remained unproved for two hundred years. When his father was ennobled in 1719, Svedberg changed his name to Emanuel Swedenborg. In 1745 Swedenborg had an epiphany. He described his vision to Thomas Hartley, rector of Winwick, as “the opening of his spiritual sight, the manifestation of the Lord to him in person”. From then on Swedenborg devoted himself to God. He wrote voluminous works interpreting the Scriptures, and announced that “no flesh could be saved”, according to Christ’s words in Matthew 24, unless a New Church was founded. He later moved to London and died there on the 29th of March 1772, a date he had accurately predicted several years previously. Sixteen years later a congregation met at Great Eastcheap in the City of London to mark the centenary of Swedenborg’s birth and founded the New Church, according to their mentor’s wishes. Swedenborg’s influence quickly spread to Manchester. The Reverend William Cowherd, curate at St John’s, Deansgate (now marked by St John’s Gardens), broke from the Anglican Church in 1793 to lead the Swedenborgian New Jerusalem Church on Peter Street, where the Albert hall now stands. Here they practiced teetotalism and pacifism. After quarrelling with other New Jerusalem Church leaders, he opened the Bible Christian Church on King Street, Salford (the flattened gravestones are still visible in the car park that now covers the site). There, on Sunday 29 January 1809, the Rev Cowherd made a sermon that changed the world. His subject was animals and, in particular, the eating of them. With those words, Cowherd began the first formal vegetarian movement in Britain. His belief was that not only were all men are created equal, but that all species were equal, that to regain the purity of the Garden of Eden before the Fall man should be at one with all life. Although the influence of Swedenborg died away with future generations, the idea of not eating animals has increased in popularity, although it is doubtful many modern vegetarians or vegans would now cite Swedenborg as an authority. A Swedenborgian church was active in the city centre until 1971. 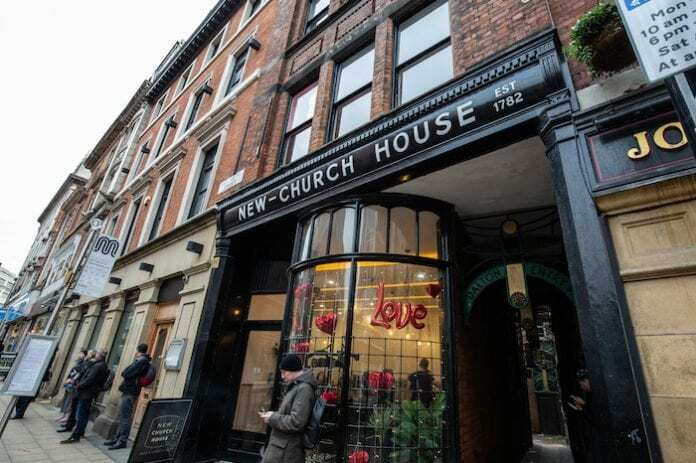 The building is still there on John Dalton Street, with the sign “New-Church House”, hyphenated in honour of the New Church Swedenborg said would be founded. 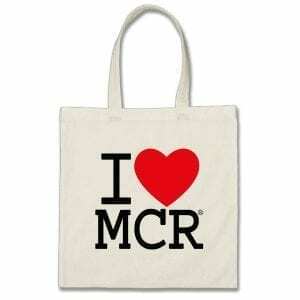 Read how Manchester got its name here. For more information on Ed Glinert’s tours of Manchester, click here.